At 7.30 A.M. we left Montserrat for the next port in Nevis. The breeze was Moderate and favourable – and the distance to be run not great. Between the two islands is a small desert island, barren & uninhabited, of a round shape, resembling very much a haycock –a stack. This is called Redonda or Round. It attracted only a passing glance, all our thought being directed to Nevis. On approaching it it seemed to rise up in one large conical shaped hill, with one or two smaller ones near it – but at a distance, and seen in a different position, as when we saw it in passing from Guadeloupe to Antigua. It bore the resemblance of a saddle. From this central conical hill, the land to the right sloped rapidly down to the sea side & is alitterated [?] all the way. To the left it slopes more gradually, stretching out into a long low point, in which it terminates. I liked to contemplate this island, because being small, the eye and mind being restricted to a narrow compass, are not fatigued, as they would otherwise have been by the extended & diversified scenery of the larger islands – which defy all the powers of description to give any thing like an adequate idea of the original. The capabilities of the painters art alone can prove efficient to depict the nature, appearances & peculiarities of such irregular scenery. Another circumstance so much against me is the very limited time which our regulations allow for the contemplation of the beauties of nature – & besides so many other objects distract our attention, either of business or pleasure, that really it is not to be wondered at, if our perceptions are blunted or confused. But all this is a digression – to return. Beyond this low point I have just mentioned, the land again rises high, running along of an equal height to a considerable extent. A stranger, such as I was, might fancy that this was a continuation or another portion of Nevis – for he sees no division – but the experienced Navigator knows this to be in reality another island, viz. that of S.t Kitts, which is only a few miles distant from Nevis. Another deception still takes places in judging of the objects within your ken. Beyond, as you fancy, S.t Kitts, two hills of very dissimilar height arise, supposed by you to be two islands – but in fact they belong to S.t Kitts. Near to Nevis, looking over the sides of the vessel, you can easily discern the coral bottom, white or dark, and the same is the case off Montserrat, and as [you] already know at Bermuda. Sailing pleasantly along the azure deep, invigorated by a fine breeze & beautiful [weather], and enchanted with the objects around us – we gradually neared the said low point or tongue of land, a short distance from which is Charlestown the Capital of Nevis. Now S.t Kitts comes more & more into view. It seems a long & narrow island, full of irregular hills, with two or three pre-eminent above the rest. At last as we were abreast of the low point, you saw plainly the channel between Nevis & S.t Kitts, called the Narrows and Charlestown. The town is situated at the very foot of a conical hill, along the sea beach. It is small, mean & paltry looking – but remember I had no time to correct this probably erroneous judgement, formed from a very superficial view, from the Vessel, outside. To the right extremity of it is a pretty clump of trees, arranged in a circle. At the left end began a narrow line of trees which is continued for a considerable distance. Immediately behind the town are trees also. These are ornaments to be commemorated, when little else presents itself deserving of admiration. From half way up the hill, down to the waters edge, you have houses & plantations in abundance. We looked on the scene with contentment and calmness – not so one of our party, who designed to land here. This was our only passenger from England. His name M.r Peter Bawrin. He was a young man about 19 to 20 years of age – tall, pale & rather delicate. His father had at his death left him a considerable property in Nevis, which had been managed by an Agent, who gave so little satisfaction, that it was deemed advisable that the young man himself should come out & look after his own interest. From all I heard I should think he would [find] it a difficult matter to arrange affairs – but not so difficult as for another – for he had served nearly three years as a lawyer at Portsmouth, where he usually resided. His is one of the many instances, in which is exemplified the depreciation of colonial property – for if he should offer his estate for sale, he either would not find a purchaser, or only on such terms as would amount to an actual throwing away of his property. M.r Bawrin, is of very respectable family – his grandfather is a Capt.n Gorley at Portsmouth, and he has an uncle called Butler [Buller ?] at Nevis a very old planter. He spent several years at the schools in France, chiefly in Tours. We were all much pleased with him, and during the whole voyage, he was like one of us. His manners were gentlemanly and mild – his conversation plain & unaffected, without pretension to learning or pedantry. He seemed equally pleased with us, and abundantly contented with our efforts to please & make him comfortable. So it was not without regret that we bid him farewell at Nevis, but I must [not] anticipate. Almost before we came to anchor a boat with two negroes came off from his uncle for Massa Bawring. As we were going on shore shortly, M.r B. contented him with sending his luggage by this boat, and accompanied us ashore in our gig. Knowing as we did something of M.r B’s history, we could easily explain, why so many negroes were assembled on the beach. The news that a young Massa was coming for first time to Nevis spread abroad & great numbers were collected, some from curiosity & others from the wish to gain favour. As soon as we touched the ground with our gig, all the negroes emulously hauled her up on the beach, while one or two thought themselves highly fortunate in assisting M.r Bawrin out. There was plenty of noise & clatter – remarks were lauded about, and questions asked at us if he was a good Massa. In the midst of the hubbub an old Gentleman approached, & uncle & nephew introduced themselves to each other, never having met before. We accompanied them to the house of the former, & had a glass of good old rum, after which we said farewell to M.rBawrin, and went for the Mail. I saw but little of Charleston, and saw nothing to make me alter my former opinion of it. There were large houses & small houses & houses of every description, but the number was not great. To most of the dwellings you had to ascend by an outside stair – & several of them had porticoes in front. Having spent nearly an hour at Charleston, at 6 P.M. we returned on board and set sail over to S.t Kitts, intending to land the Mail tonight. The breeze was moderate and favourable, but owing to the darkness, I am unable to tell you any thing with certainty. In less than two hours we lay too & I accompanied the Master with the Mails. Two gentlemen, whose names I know not, & whom we took on board at Nevis, went with us. We seemed to pull up an excellent harbour, and landed on a sandy beach. The Mail being delivered, by the aid of moonlight we traversed the streets. The town seemed to be large & populous – but I had better say nothing than too little & that perhaps erroneous. At 10 P.M. we returned on board and immediately got under weigh for Tortola. Thursday 29th August – light winds all night. In sight this morning of Nevis – S.t Kitts – Montserrat – Eustatia – and in the distance are visible the islands of Saba – S.t Bartholemew & S.t Martins. When I came upon deck, we were abreast of Eustatia, a Dutch island. This at first glance I mistook for Nevis – but I soon perceived a difference. The island is divided into two unequal portions of very different characters. 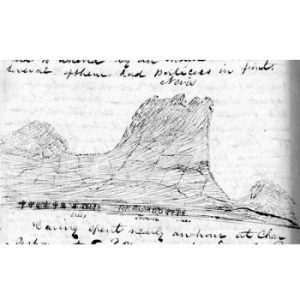 One portion resembles Nevis in this that it has one large conical hill, which to our left slopes down to the lowlands – but has this difference that the right does not slope as at Nevis. This is the cultivated portion and right under it is the Town. The other part is nothing but a collection of rocks & hills with no evident declivity & I should fancy barren. Our present position also enables us to see the NW end of S.t Kitts. The appearance is beautiful. From the high hill I mentioned to be at its extremity, a fine bold slope terminates in lowland on the sea shore. We cannot at this distance see any plantations – but I was told that it was highly cultivated. Our course next led us to pass pretty close to Saba. It is very small and rocky with a high hill in the centre. The weather all day was very fine and the breeze favourable but light. We had expected to have reached Tortola today, but owing to want of wind we were unable to accomplish our intended purpose.